The string quartet adds elegance, grace, and beauty to any occasion and now it has a wow factor that you've never seen. These electric strings groups are guaranteed to entertain, engage, and excite the crowd at your next corporate or private event. This electric strings group has rocked audiences worldwide with their blistering solos, unique arrangements —not to mention their beauty and charm. The girls have performed with some of the biggest names in the business, from Beyonce to Shakira to Andrea Bocelli, and have appeared on America’s Got Talent Season. They perform on Yamaha instruments and their electric sound ranges from the classics to rock. Powerful. Dynamic. Electrifying. Uninhibited. Chamber music this is not. This all-female electric strings quartet has a repertoire that includes top hits from artists like Muse, Coldplay, The Rolling Stones, Led Zeppelin and everything in between. 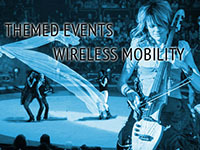 They play high-energy live music for corporate entertainment, social events and festivals. Want to make your next event a showstopper? This is the act to hire! This electric string ensemble not only plays the elegant classics, but plays contemporary covers from Bruce Springsteen to the Eagles to the Gypsy Kings. Their vibrant sounds add a new flavor to the word ‘Electric’ and is a definite crowd pleaser. Whether a corporate event or social reception, they entertain and engage your guests.